Airports in India are managed by Airports Authority of India (AAI). It works under the Ministry of Civil Aviation and it is responsible for creating, upgrading, maintaining and managing civil aviation infrastructure in India. We have seen in most of the exams few questions asked from Airports also. 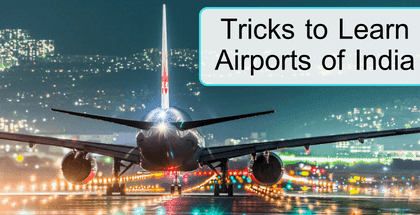 Below is the list of almost all Major and Minor International and Domestic Airports. Veer aur (And) Nikki apni Nano Car main Savar Ho kar Port tak Gaye. Vishaka ne apne dost Ram and Vijay ko apni Cousin Tirupati se milaya jo Raja ki Behan thi. Assam ka Dabbu apne dost Gopi se milne uske Gaon Silicone valley main gaya. Can learn from the Name of city itself. Ambika went to Chatrapur to take Rai (advise) of her uncle Swami Vivekananda. Indira Gandhi International Airport is only airport in Delhi. Dabbu went to Goa to meet his Maa and Paa. Gujarat ke Sardar Ahmed se dar kar Raj Dholwala Surat Chupa kar Vadodara Bhag Gaya. Lady Gaga and King Kong performed at Shimla to raise money for BhuKamp affected Kullu. sheikh of Jammu went on bike trip from Sri lanka to Leh. Hunda na je Ranchi da cute Mundya te Sona Jaam pi kar break up kar dita hunda. Rey Mysterio of Belgium gets trained at Camp of Bengal on every Mangalwar. Both Kannu and Trivender are Coached by khoji Kalicharan of Kerala.